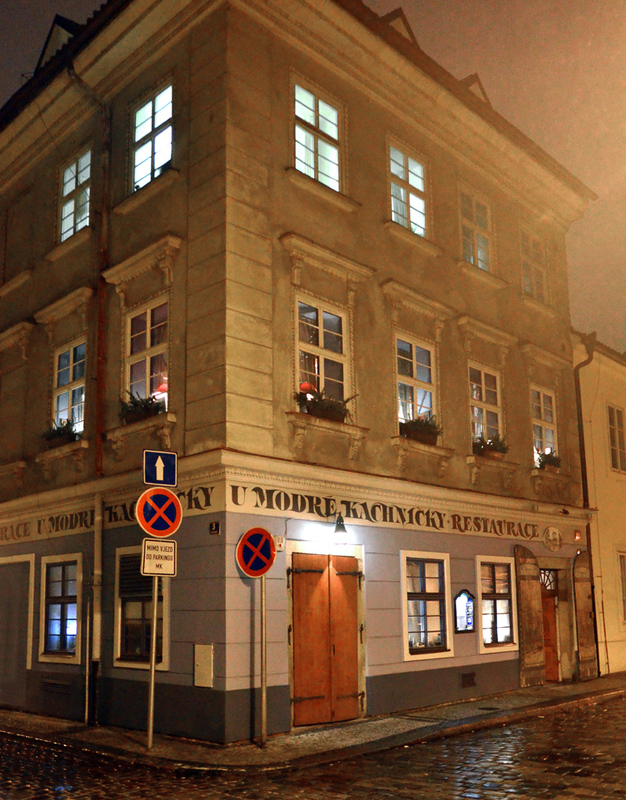 To continue our gastronomical tour of Prague, after the Blue Duckling, we’re heading to the Jewish Quarter for a dinner at La Dégustation Bohême Bourgeoise, one of only two restaurants in Czech Republic to have a Michelin star (the other one is Alcron, which serves an “international” menu). 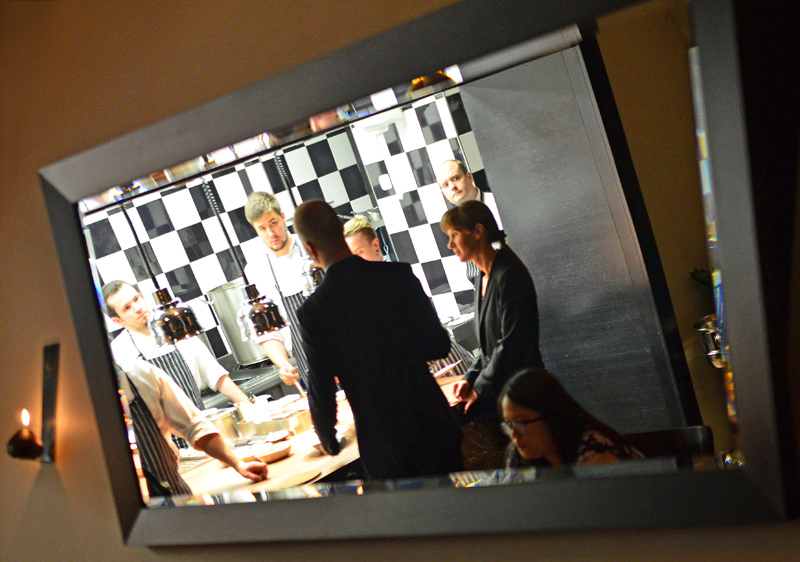 It’s also one of the only establishments, or maybe the only establishment, to promote a modern Czech cuisine. No Old Bohemian meat platters, roast duck, or bread dumplings today! But back to Prague, and LDBB. 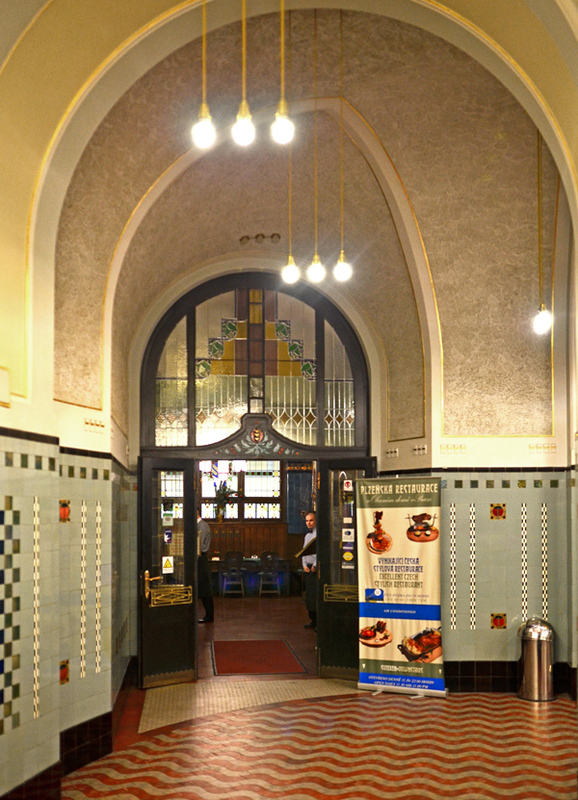 The chef has been working with the Ambiente group since 1996, first in their eponymous restaurant, then at Café Savoy, a place that recreates the atmosphere of the cafés of the First Czechoslovak Republic (complete with Neo-Renaissance ceiling), where Franz Kafka used to hang out. He later took the reins of La Dégustation when it opened in 2006 —Sahajdák, that is, not Kafka. 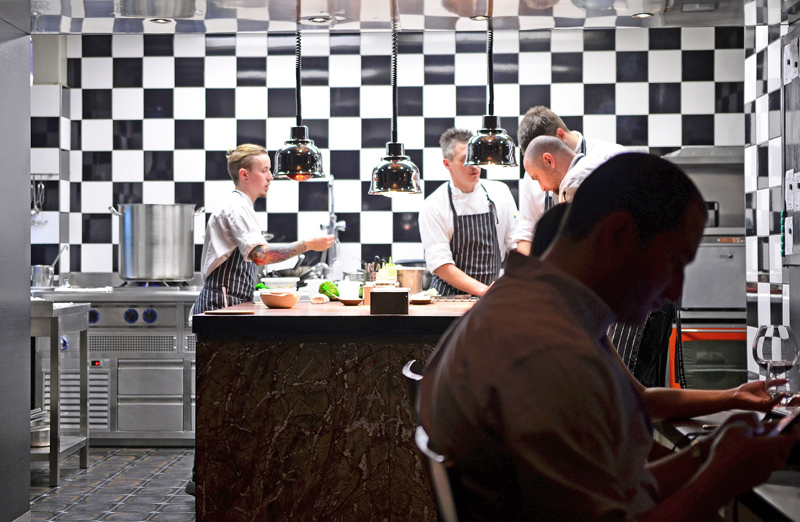 Here’s another article where the chef explains his philosophy. It turns out that the main source of inspiration for his modern creations is a Czech cookbook from the late 19th century, Marie Svobodová’s Kuchařská Škola (Cooking School), which sounds to me like the Czech equivalent of Elena Molokhovets’ Gift to Young Housewives. And we get another non-prescient quote from Oldřich: “If Czechs are cooking French cuisine, who is going to cook Czech cuisine? Certainly not the French”. I should have left him my business card. The menu offers two prix-fixe options: the Dégustation Bohême Bourgeoise, 6 courses that represent an “interpretation of the refined culinary school of Marie B. Svobodová from the late 19th century”, and the Dégustation du Chef, which is composed of the same plus 5 additional courses featuring “modern cooking techniques and new trends” by Oldřich Sahajdák. In pure modernist fashion, each dish name simply consists of three or four ingredients: a boring habit that I find about as inspiring as an Ikea catalog, the absolute opposite of the Proustian madeleine. Luckily, the stated provenance of some ingredients adds a touch of variety — maybe it even evokes something for Czech geography buffs. Either prix-fixe can be served with wine pairings or with juice pairings. Not plain, pure juices, mind you, but unusual, diluted juice mixtures specially crafted to mimic wines and really pair well with the food. Some juices are served at room temperature, and some colder. Now let’s get started! 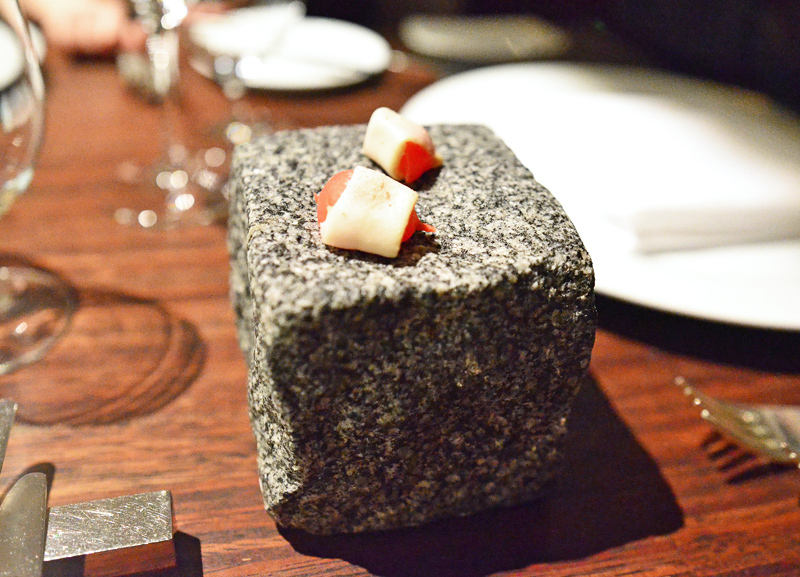 The first amuse bouche arrives: a fermented radish wrapped in lardo. I wouldn’t eat a bowl of them, but the pronounced acidic and salty tastes are a good way to prepare your palate for the meal. Next comes a trio of amuse-bouches, already offering more subtlety and a glimpse at some of the flavors that we’ll find in subsequent dishes. 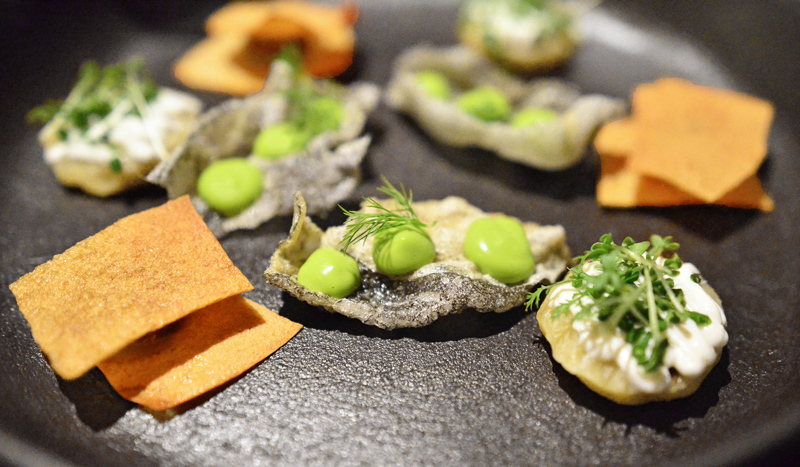 The very crispy, salty catfish skin, topped with a green dill and lemon mayo, is my favorite of the lot. 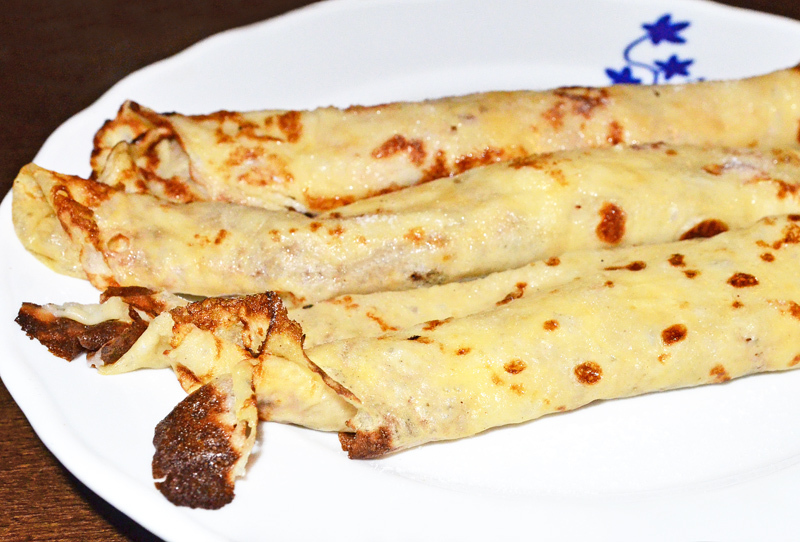 The pancake (which may or may not be plain) is covered with horseradish cream, chives, and some other herbs. 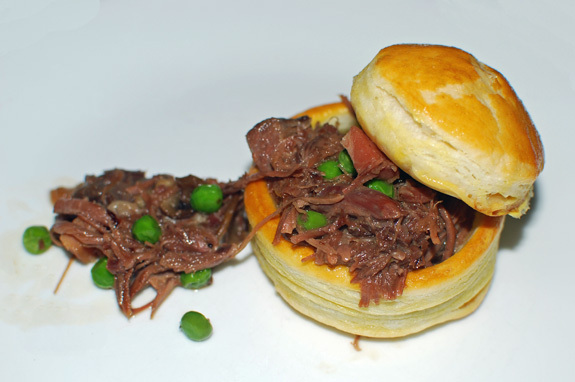 The golden sunchoke crackers sandwich a spoonful of duck confit. All three are quite nice. Again, the thing about most amuse-bouches — not just here but generally — is that I wouldn’t order a whole plate of them, but they’re good at bite-size. Another amuse-bouche, and hey, it contradicts the observation I just made! 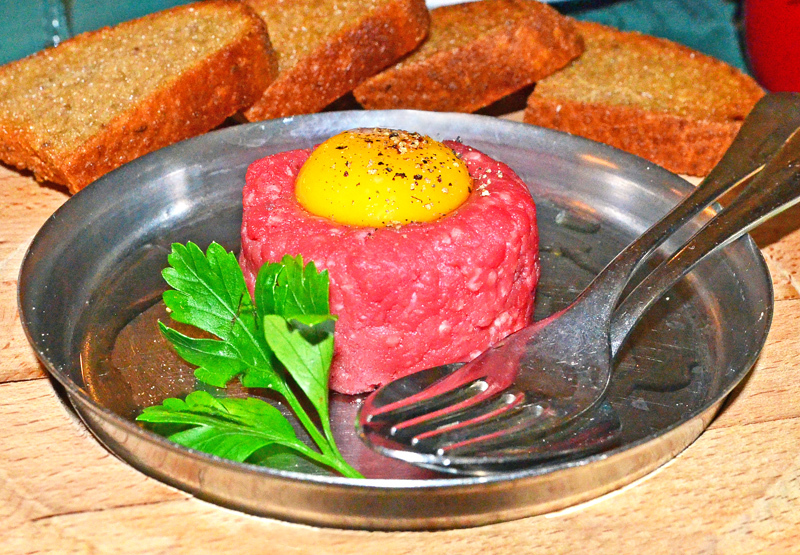 This time, it’s a tiny beef tartare between two pieces of crispy bread toasted in butter. 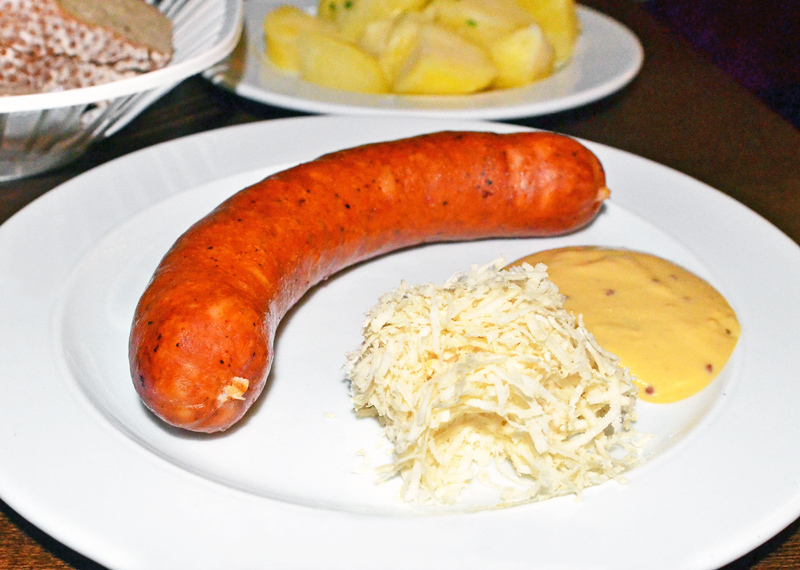 A Czech classic at any portion size. Even if it’s very tasty, maybe this is one too many amuse-bouche? First course: snails, garlic, leek, walnuts. The snails come from the Lusatian Mountains, we are told. Are some soils more suitable for snail farming? 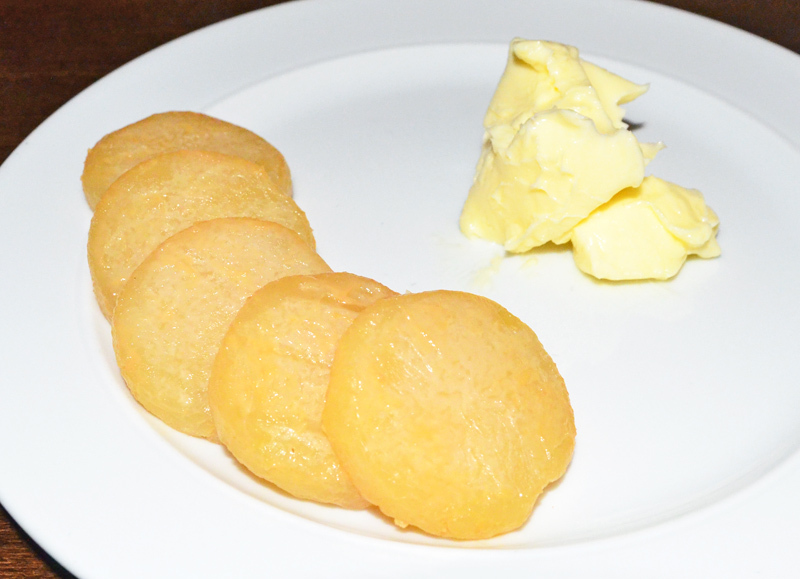 Who knows… It’s an appetizer with a lot going on, a little bit sweet, overall quite good. The snails are very tender, but I’d have trouble identifying all the remaining ingredients — I guess austere dish naming is good for something, after all. Juice pairing: apple-leek. Essentially a leek juice with a bit of apple in it, this will end up being my least favorite. Second course: pumpkin, Prague ham, whipped cream. The question that comes to mind is, what happened to the Prague ham? Wasn’t I supposed to get a plump pork shank on my plate? 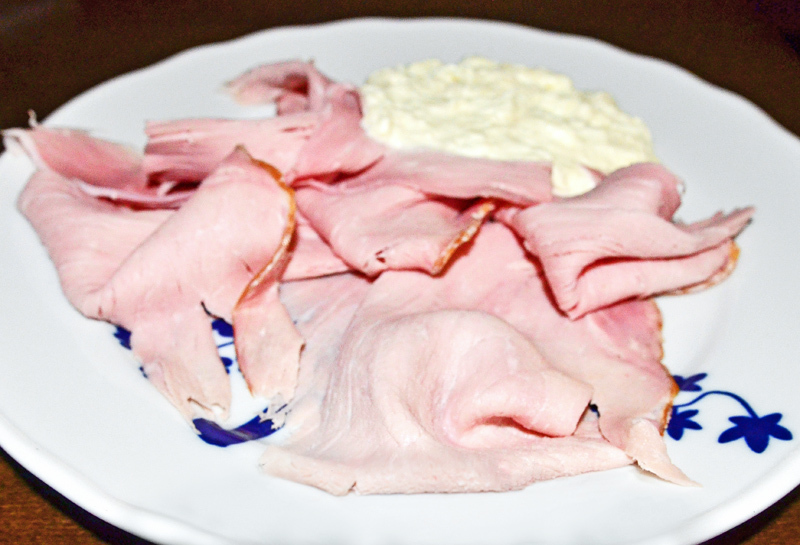 The ham’s actually used to flavor the whipped cream, a great trick. The soup boasts a fragrant pumpkin taste without being too sweet (some recipes add liberal amounts of honey). Simple but excellent. The flavors are closer to one’s stereotypes of Central European cuisine, but the vehicle is original. Juice pairing: apple-elderflower. This is definitely more familiar territory, especially for European palates. The nose is very floral but the taste is mostly apple. Third course: catfish, yeast, radish. Yeast, that’s interesting. I forgot to take a picture, but thanks to fellow bloggers and instagrammers, I can tell you the dish looks something like this or this. The catfish comes from Třeboň, a region rich in lakes and rivers. Sadly, whether it comes from Třeboň or a farm in China, catfish still isn’t my favorite fish by a long shot — it just doesn’t have a lot of flavor. I love the very sweet yeast broth, which tastes like bread (duh), although it’s a bit too sweet and concentrated to eat on its own once the fish is finished. Yeast broth is an idea I’ll keep in mind for my own recipes. The thinly sliced black radish and raw Brussels sprouts pair pretty well with the rest. Juice pairing: broccoli-rhubarb. Tastes weird on its own, but goes really well with the food. Fourth course: shallot, pear, lard. 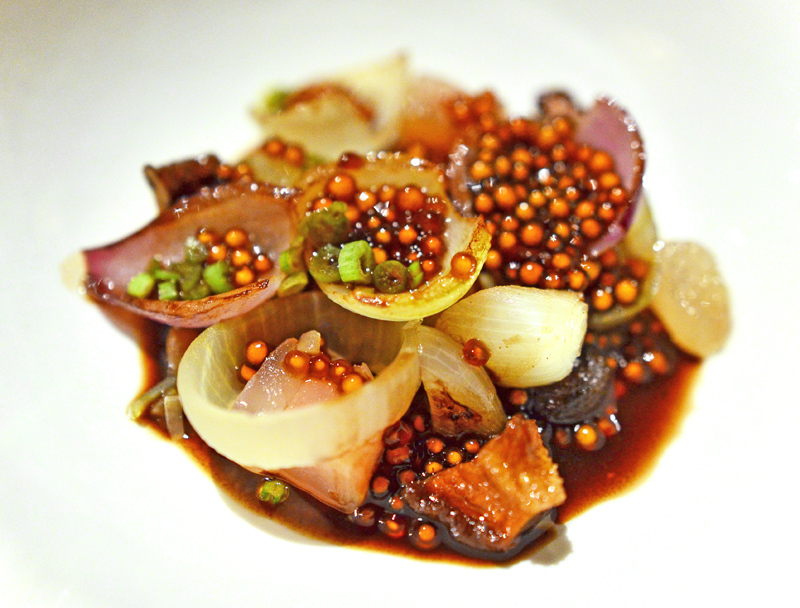 The shallots — some grilled, some pickled — are mixed with pieces of dried pear and lardo, and served in a wine reduction, creating a variety of textures. Did Marie Svobodová really advocate the use of tapioca pearls? I don’t. They’re pretty, but I’ve never understood what they’re supposed to bring (yeah, yeah, that chewy texture). Nevertheless, the dish is very pleasant and the number of elements involved makes it more complex than it seems. This is also the most visually appealing so far, in person, as the pieces of shallots cut into various shapes add height to the composition. Juice pairing: sea-buckthorn-thyme. The taste is light on sea-buckthorn and strong on thyme: a good choice with the dish. Juice pairing: plums. Yes, with an s. It’s thin but very rich, almost oxidized, very wine-like. While oxidation destroys the complexity of good wines, I find that when it’s applied to plum juice, the result’s a lot more interesting. I want to learn how to make that! 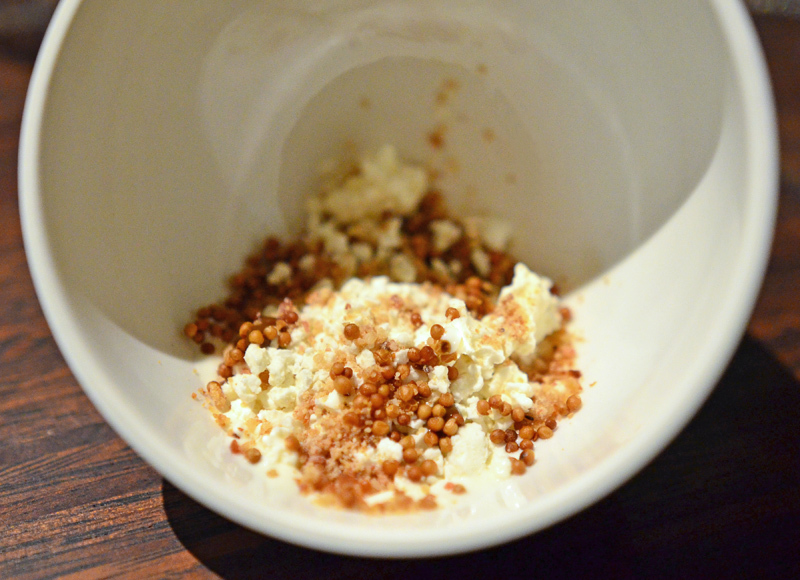 Sixth course: olomoucké tvarůžky, garlic, cracklings, mustard. Olomoucké tvarůžky is usually a yellowish, pungent soft cheese made from skim cow’s milk — and we’ll encounter it again soon in another post. 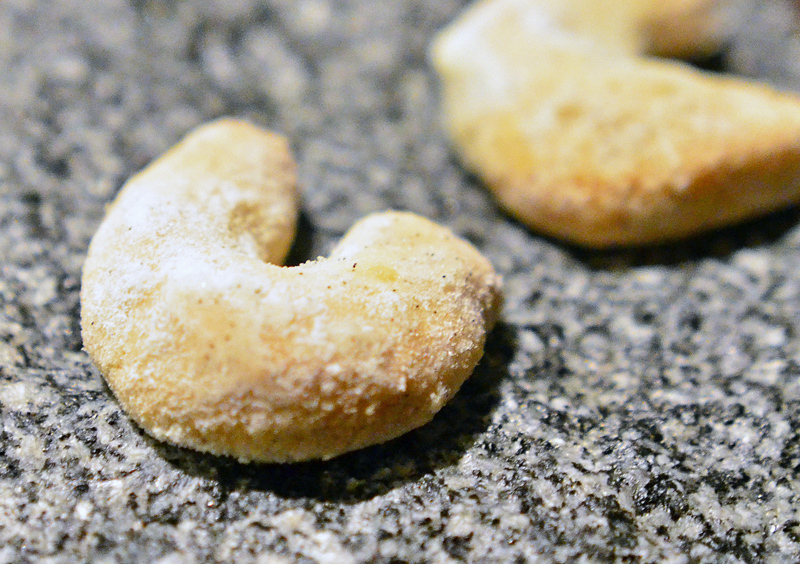 At LDBB, the very cold, crumbled cheese is a bit salty but much more approachable. There are also some smoky elements (the cracklings? 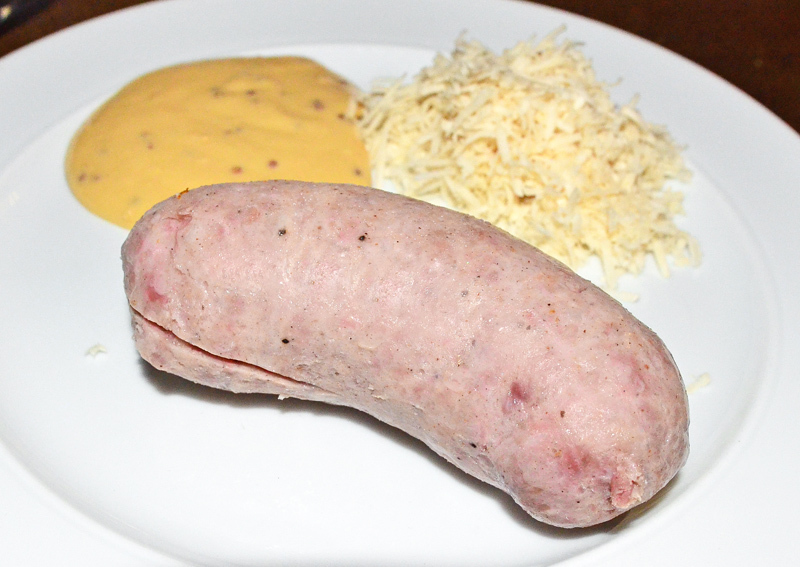 ), mustard (though it doesn’t overpower the rest), and some type of garlic granules, which all contribute to a pleasant texture with a lot of crunch. At the risk of sounding repetitive, this is the kind of combination of traditional flavors and modern preparations that successfully illustrates the chef’s philosophy. 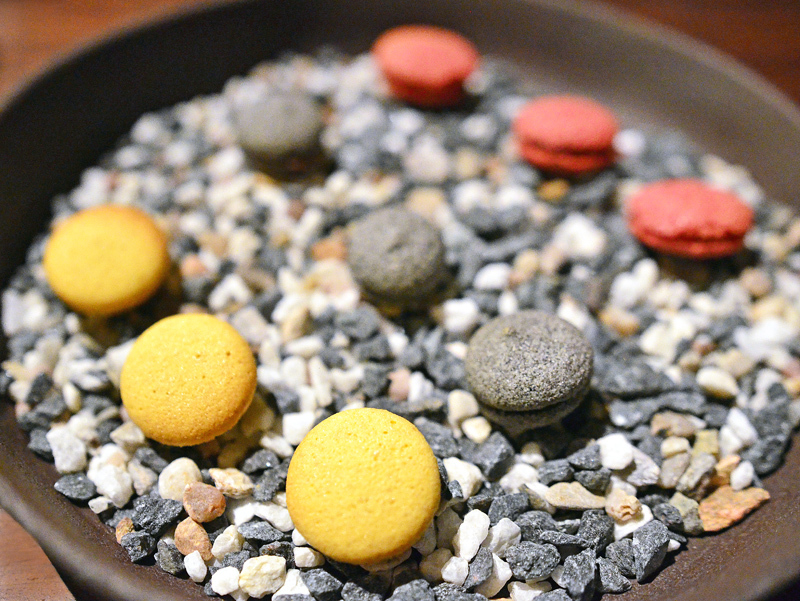 We finish the meal with some colorful mini “sponge cakes”. Their crunchiness makes me think of some kind of airy cookie sandwiches, a bit like macarons. And texture-wise I would have preferred actual macarons! The buckwheat flour in the batter tastes great, and the flavors are all satisfyingly intense: sea-buckthorn, walnut, and beet. For the record, some of the extra dishes they’re making for the 11-course marathon are: “sturgeon caviar, cauliflower”, “mushrooms, broccoli, pearl barley, marjoram”, and “celery root, straw, truffle”. If I recall correctly, the wine pairing is 100% Czech and 100% white (except for dark beer with the dessert). This is a bit surprising and disappointing, even though I hear that Czech whites are better than Czech reds. 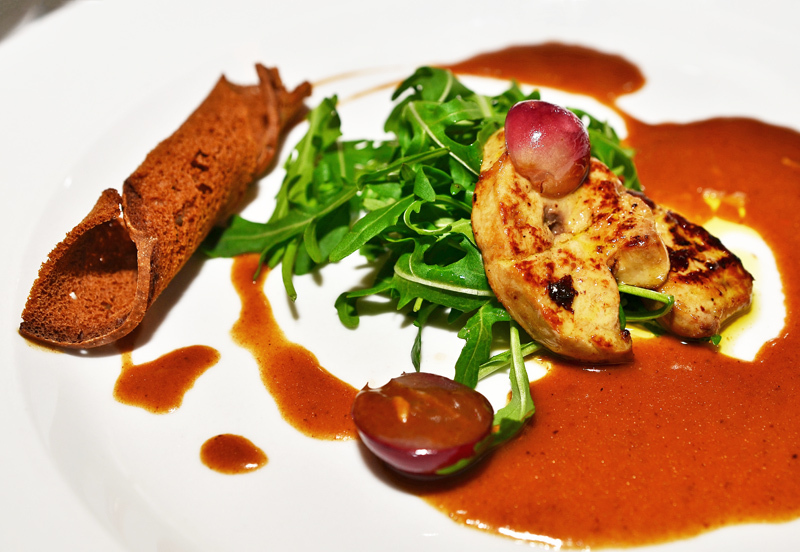 The food doesn’t really require red, but the sommelier could certainly make it work with some dishes, like the chicken. Some of the wines are interesting, such as the 2011 Valihrach Sauvignon Gris or the 2010 František Mádl Sauvignon Barrique. Others, such as a Gruner Vertliner and a Riesling, are fine but nothing special. 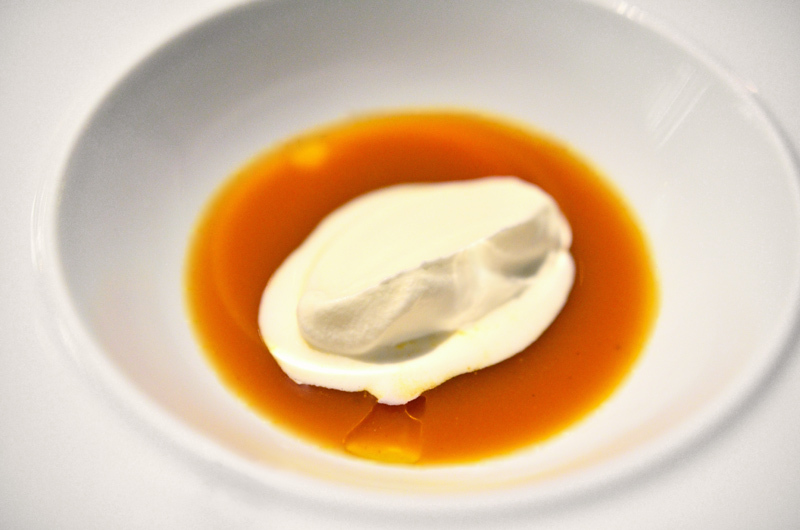 Not everything’s perfect at La Degustation Bohême Bourgeoise, of course. The snail course is a little too complicated for its own good. 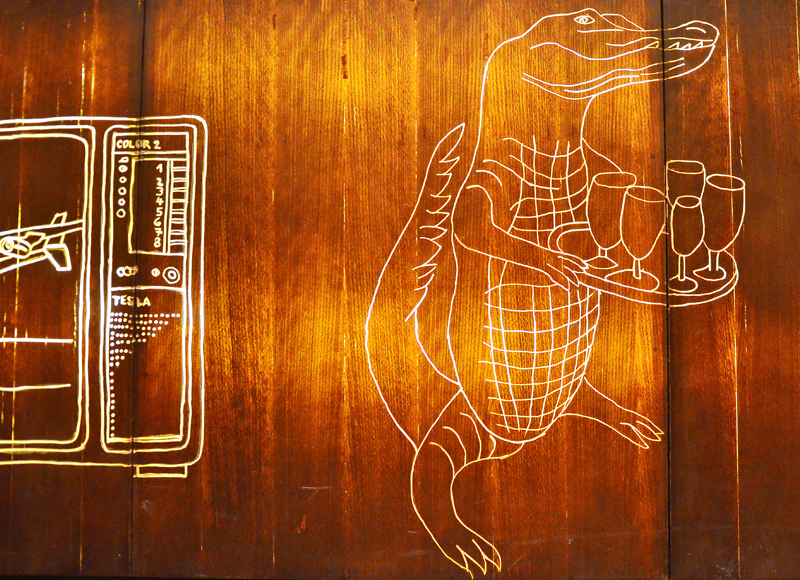 And I’d be happier if the catfish was replaced with trout, and the chicken with duck (paired with a Czech red wine). But hey, I’m not the chef here. 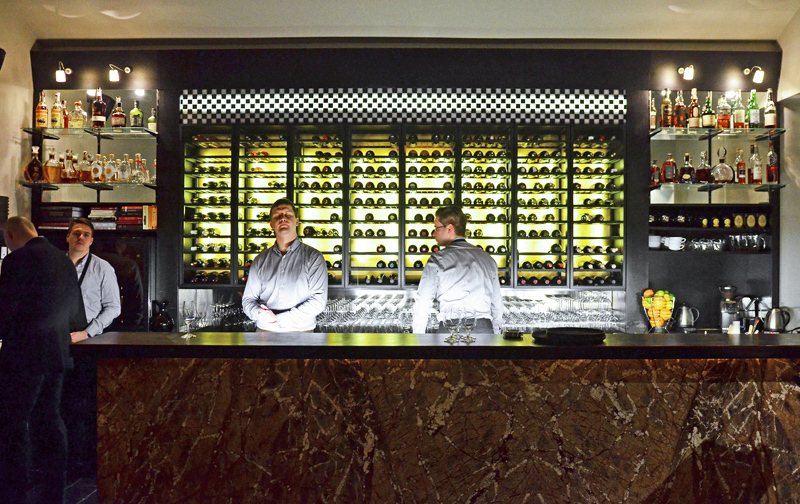 Overall, the restaurant stays true to its mission, and it pays off. 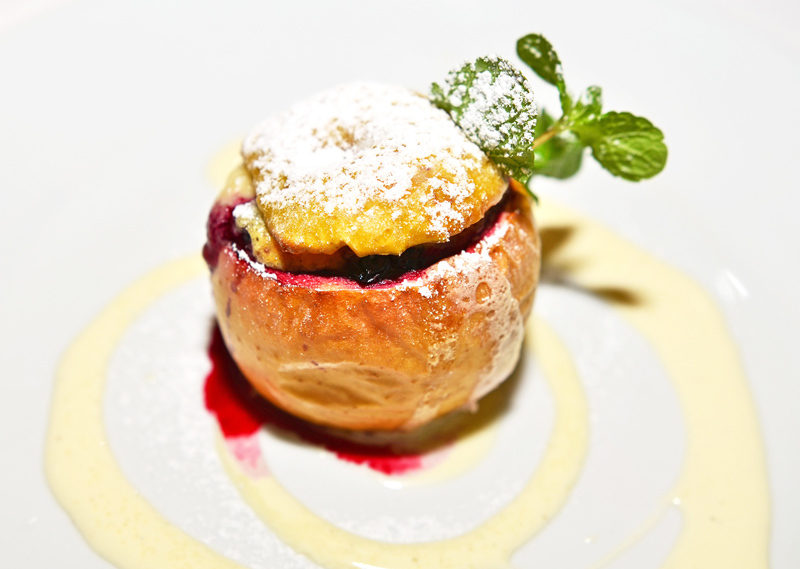 The dishes manage to be creative while still referring to traditional Czech elements, something I admire. For what it’s worth, they’ve earned that Michelin star. 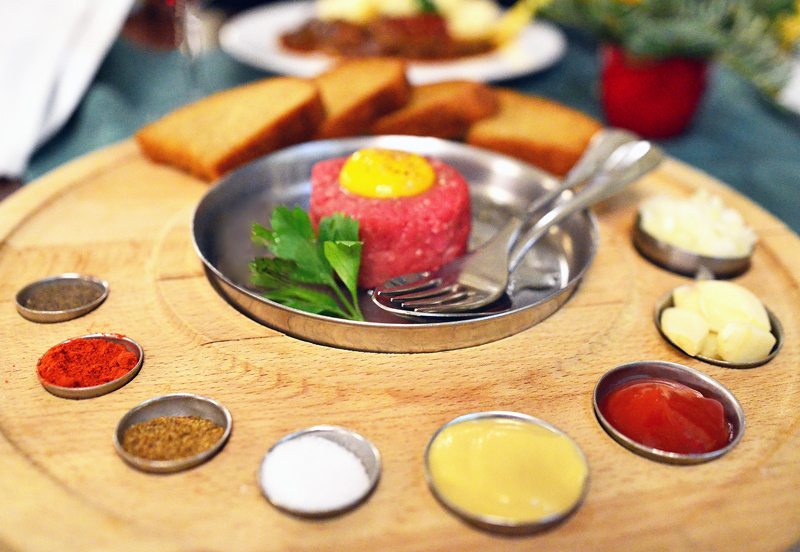 What do you do when you write a blog about Eastern European food and go to Prague on vacation? You go to plenty of restaurants, of course! Of all the destinations east of Berlin, Prague is one of the few where you can expect to eat quite well (the others being Budapest and Warsaw) — at least if you do your homework. 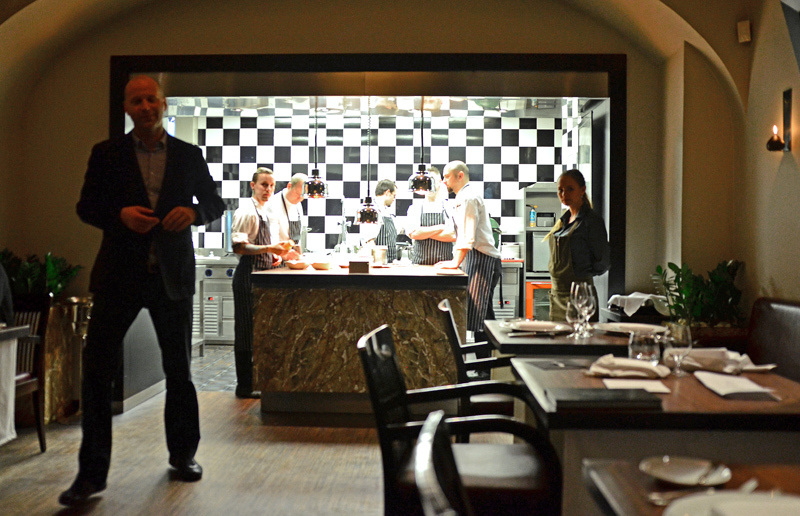 The Czech capital counts a still-meager-but-certainly-better-than-nothing two restaurants with 1 Michelin star each. 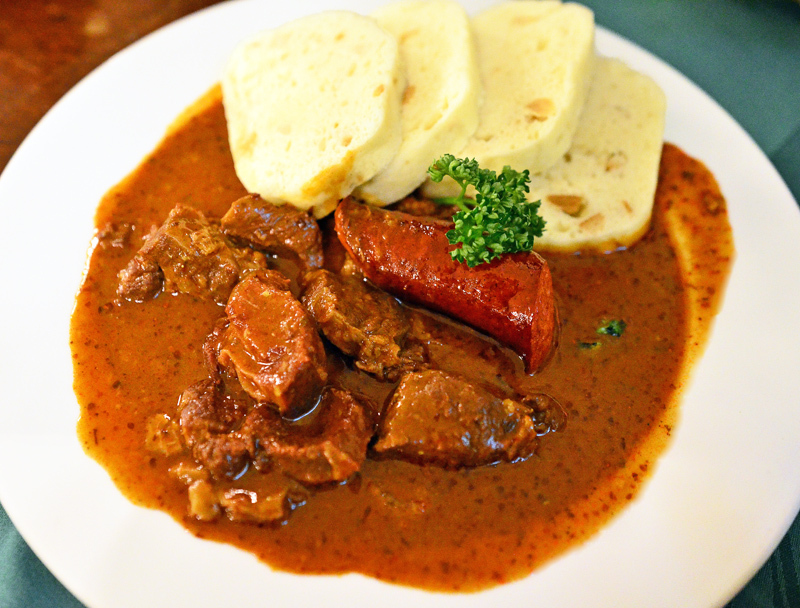 Yet, it can be hard to find Czech cuisine that rises above the average pub grub that’s been served to locals and tourists alike for decades: shoe-sole-tough stew meat, heavy sauces, and lumpy dumplings. 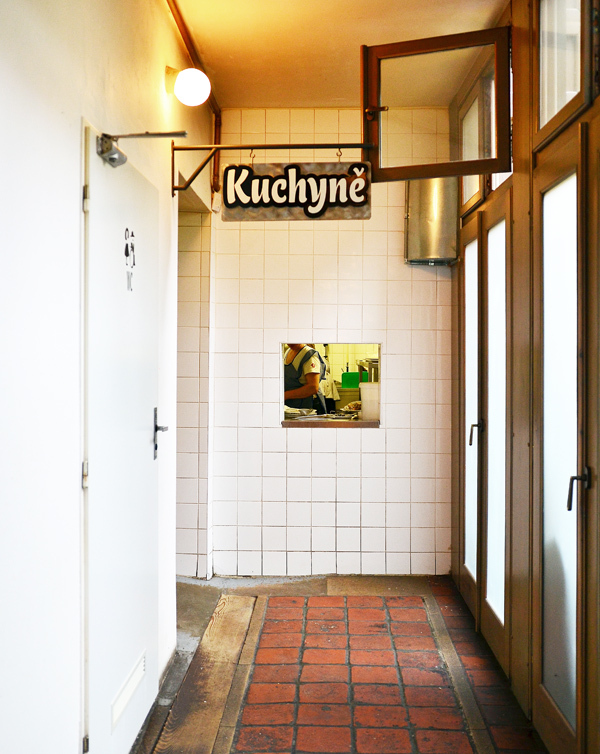 The quest is made even more difficult by the profusion of higher-aiming French, Italian, and international eateries that seem to believe that anything’s better than Bohemian food. 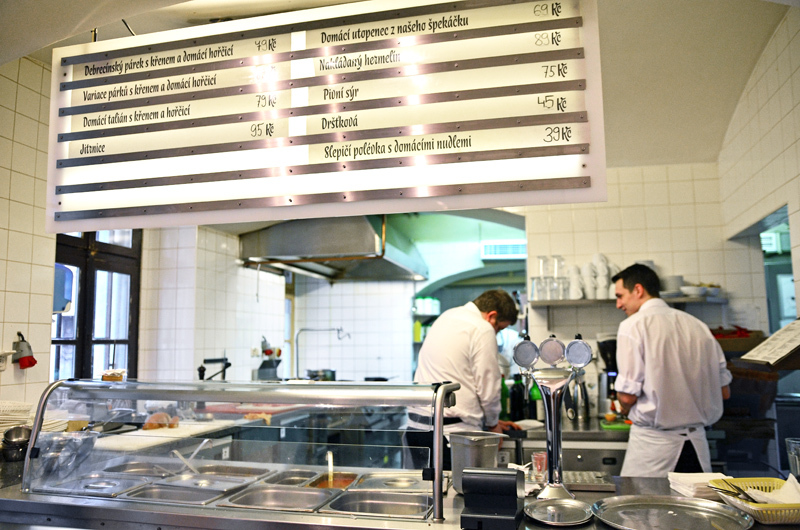 Where else will you find a place like V Zátiší, where a small handful of traditional Czech dishes are buried in an Indian menu augmented with a risotto and a ravioli dish, some foie gras and a tuna sashimi? This goes way past blurring the line between fusion (a terribly dated term anyway) and complete mess. 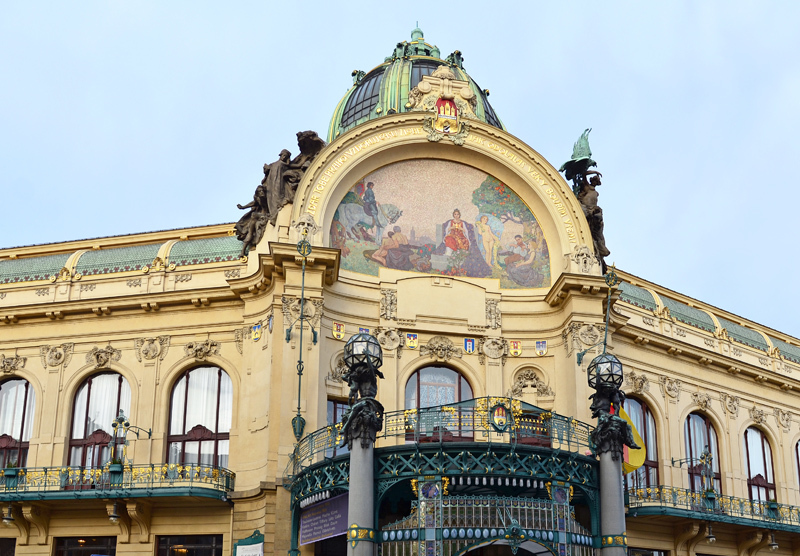 During my time in Prague, I’ve tried to look for places that would showcase the best of Czech cuisine today from different perspectives; from the everyday beanery to the upscale modern restaurant. U Modré Kachničky (“blue duckling” in Czech), with its two branches located in Malá Strana and the Old Town, respectively, sits somewhere in the middle. 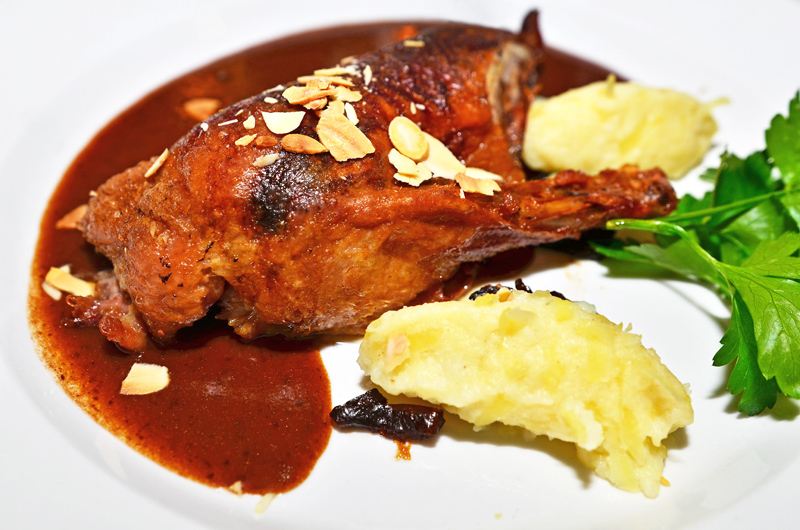 The menu is heavy on traditional Bohemian game and duck dishes, but executed properly. Apparently, chef Michael V. “loves to look for new ideas in old cookbooks and give long forgotten meals a fresh modern touch”. No spaghetti here: beg a plate of plain pasta for your picky child, and you’ll be answered, “Sorry, this a Czech restaurant”. Well said. 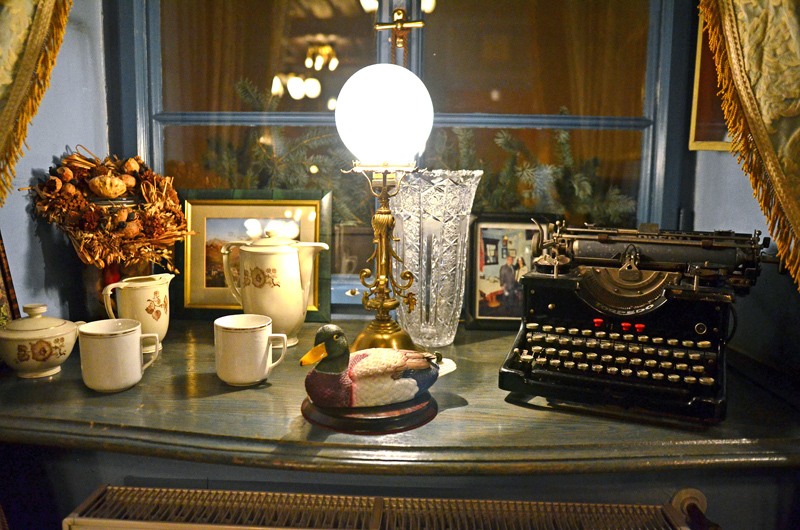 The Blue Duckling is an institution of sorts, having welcomed a long list of famous guests such as Václav Havel, Sean Connery, Tom Cruise, Gérard Depardieu, and members of Pink Floyd. And it’s easy to see why: the achingly beautiful rooms are richly decorated with hand-painted wallpaper, oriental rugs, antique furniture, and secluded tables in each nook and cranny. I discovered the place back in 2003, and have been wanting to return ever since. So when planning my recent trip, I went as far as choosing a hotel situated right around the corner from the restaurant! The rest of this post is going to read a lot like a restaurant review — a double review, at that, since in defiance of all diets known to man, we decided to visit both branches over two consecutive nights. 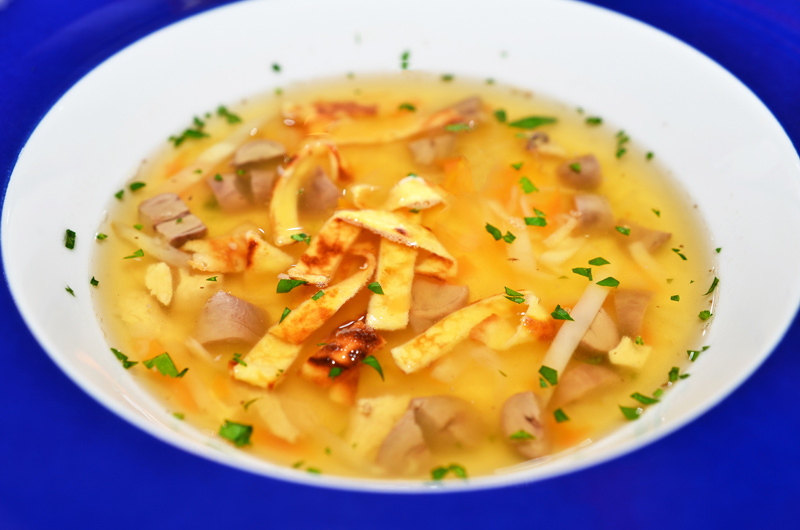 But it’s also a good introduction to Czech cuisine, as we’ll some look at some classic dishes that figure on almost every menu in the country. 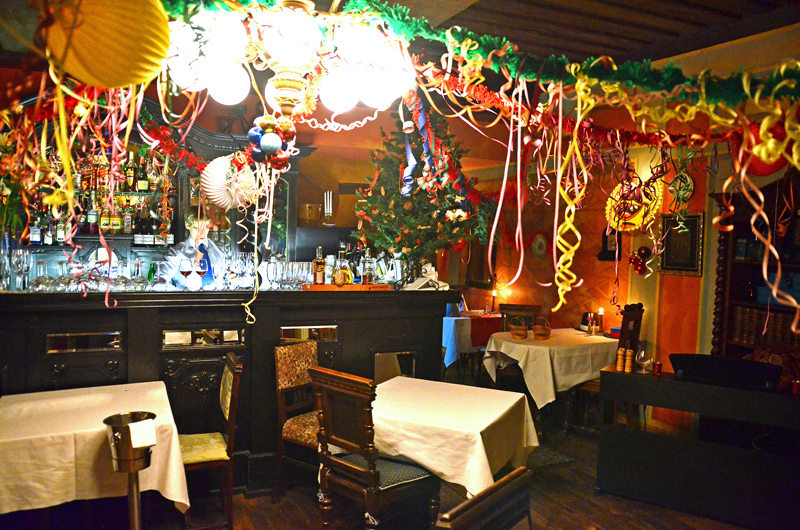 Finding a good restaurant for New Year’s Eve when you’re traveling can be a challenge. More often than not, the best solution is to just opt for a simple dinner and keep the celebration for later —whether it’s later that night or on another day all together! Fancier places have a penchant for biting off more than they can chew, devising elaborate dishes they don’t always have the skills to cook (especially for a full house of patrons all arriving more or less at the same time — a kitchen nightmare), coming up with 10-course menus meaning 10 chances to screw up, and of course jacking up the prices more than accordingly. 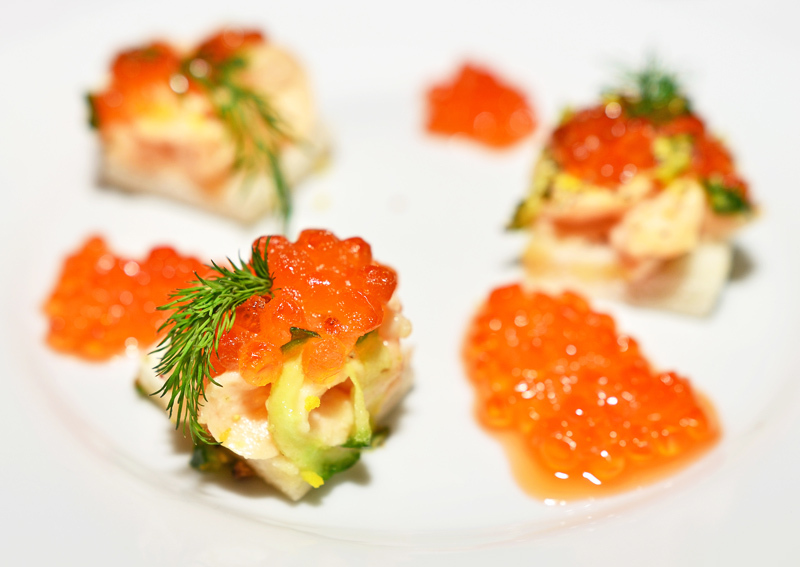 The real fancy places might get it right, but still tend to surrender to the general public’s decidedly monotonous conception of luxurious festivity: caviar, foie gras, truffle (or the chemicals that pass for truffle these days), lobster and the like. In other words, prepare to be disappointed. UMK II kept expectations at a manageable level. It wasn’t cheap, but it was very reasonably priced. 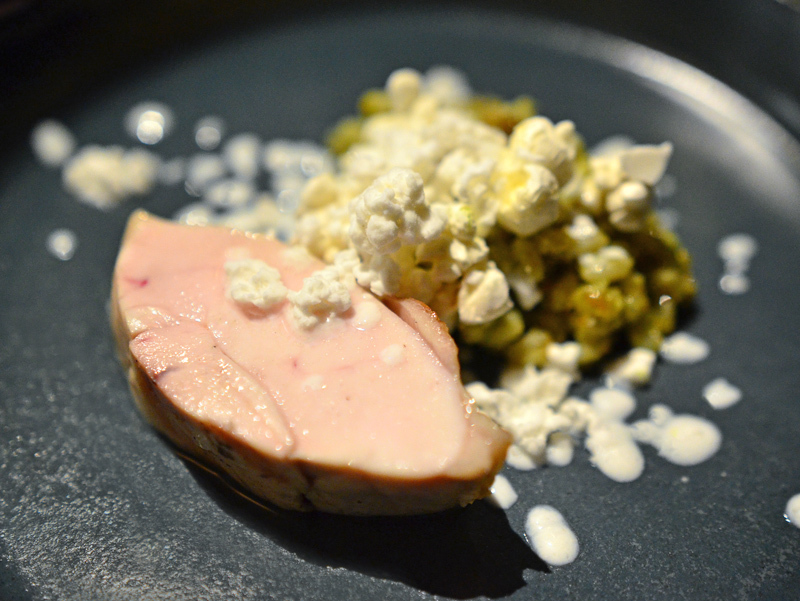 They offered a 7-course prix fixe (including the aforementioned foie gras and fish roe), but it wasn’t overly sophisticated or wildly divergent from their daily menu — which was another important point for me: I go to a restaurant to taste their cuisine, not whatever food they feel obliged to put out for a holiday. 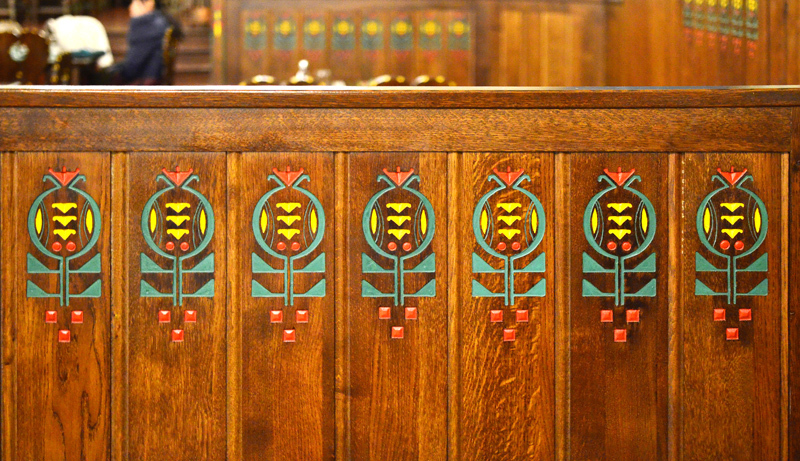 Opened in 2000 in a building just a few minutes’ walk from the Old Town Square, this second branch of the Blue Duckling uses the same cozy setting and antique arrangement, with hardwood floors, heavy curtains, antique furniture, and brightly colored walls covered with landscapes and still life paintings. And, on the day of our visit, tons and tons of holiday decorations. 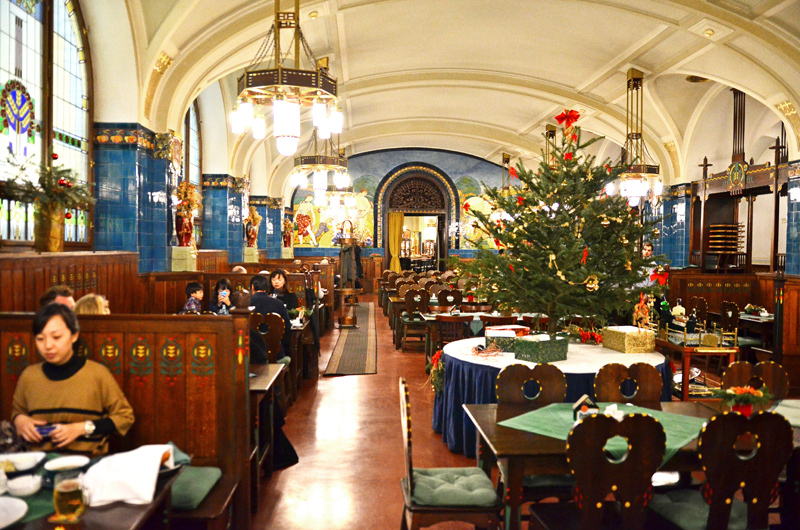 I have nothing against garlands and Christmas trees, but that definitely took away some of the place’s charm. On normal days, the menu is similar to what’s on offer at the mothership, though not identical. 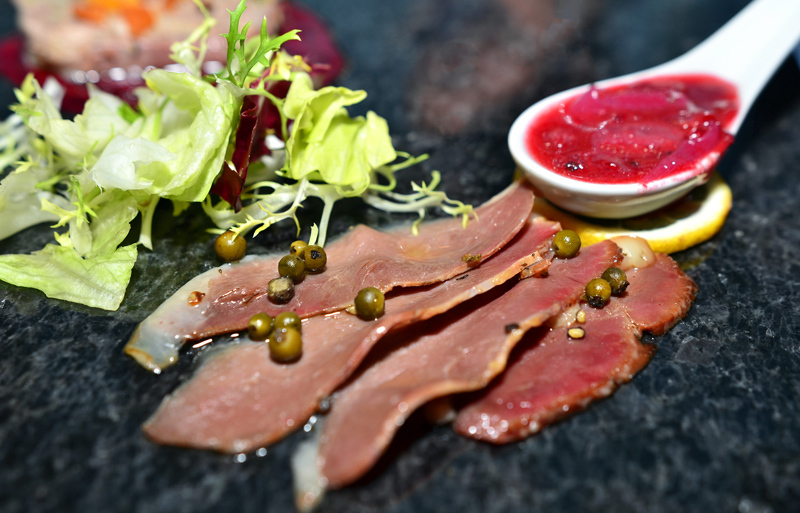 Many of the duck, wild game, and specialty dishes are prepared in the same style, but slightly differently. For New Year’s Eve, we had the choice between two menus: one that stayed close to the regular à la carte menu, and one meatless alternative that featured trout terrine, cream of lentils with crayfish, and smoked pike-perch. As I said earlier, it would have felt wrong to me to go with anything but the former. 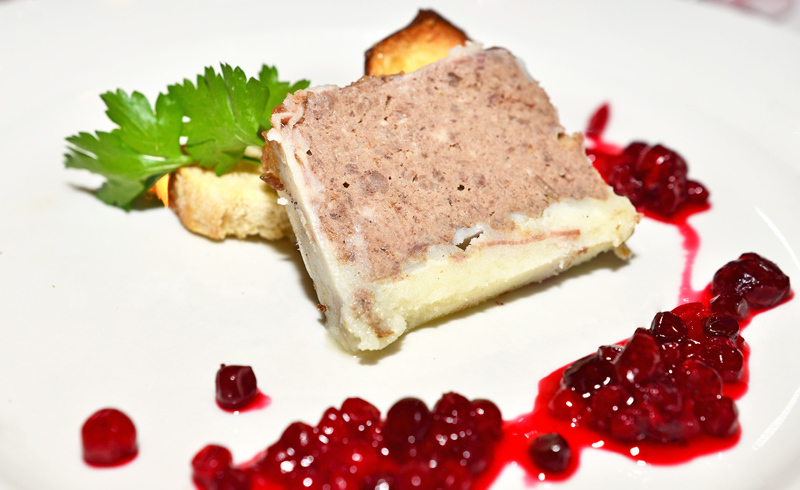 Next, the venison pâté (something that appears on many Czech menus), arrived with a slice of sunflower bread, a sour cranberry sauce, and slices of dried apple. Nothing very surprising here either, and nothing wrong with it, except maybe the pâté tasting a lot more like liver than game. The quail consommé turned out more interesting. 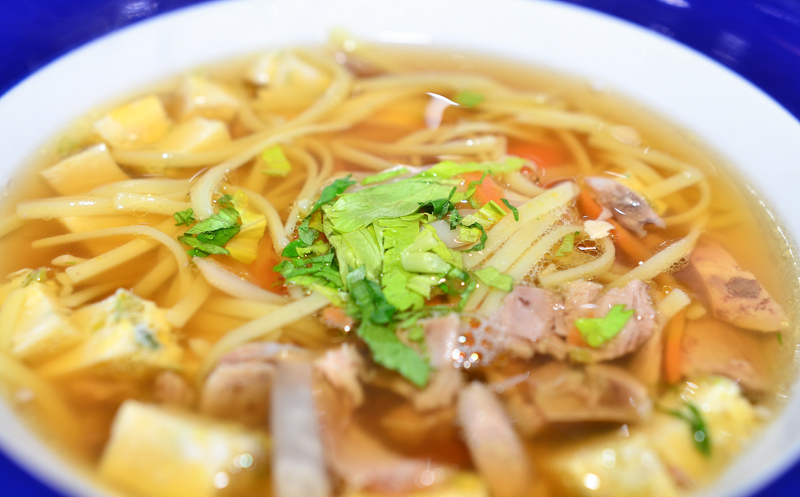 The broth might have been a bit salty, but I loved the crispy noodles (probably boiled then fried), as well as the tender and slightly gamy duck hearts, a perfect match for the flavorful pieces of quail. I usually don’t like the texture of heart, duck or otherwise, but I would eat those again… in a heartbeat. And another New Year’s Eve darling, the seared foie gras. The slice was rather thin, but the gingerbread sauce with grapes was unusual enough and went well. 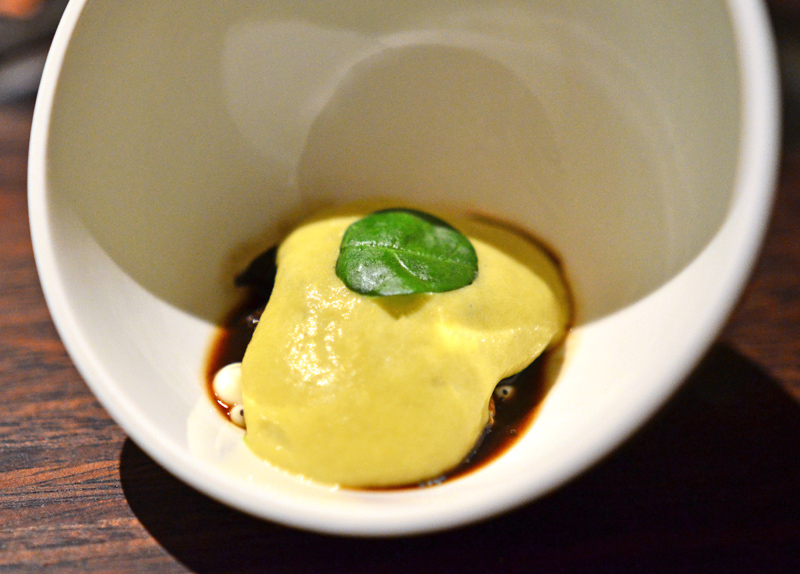 The gingerbread “cannelloni” was dry and just okay, and the arugula didn’t pair well with the foie gras. This was obviously not a very local dish, especially considering that force-feeding animals for non-medical purposes, as usually practiced in foie gras production, is banned in Czech Republic. 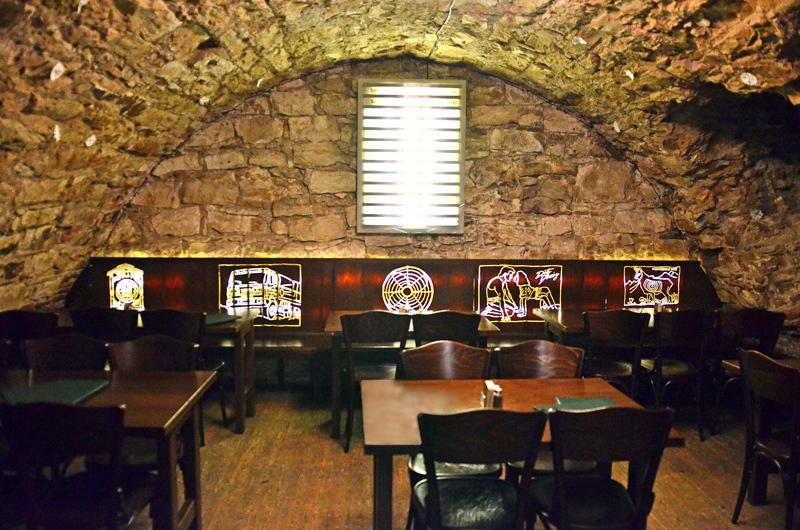 We’ll chalk it up to the restaurant’s focus on everything duck, and the influence of Hungarian cuisine from a couple of borders over. After a palate cleanser of lemon sorbet laced with Grand Marnier, next came the smoked duck with prune and plum brandy sauce. While the smoke was a little bit harsh, the meat was very tender and the sauce paired well with it. That’s more than I would say about the potato dumpling, a very heavy and bland affair. Dessert consisted of a baked apple stuffed with berries (raspberries and cranberries, I believe), surrounded by an excellent vanilla crème anglaise. The whole dessert boasted the right sweet-sour balance and was quite successful, without being insanely original. For a New Year’s Eve menu, I’d say UMK II did pretty well. They played it safe, and most of the food was good, except for the questionable gingerbread cannelloni, the failed arugula pairing, and the borderline-inedible potato dumpling. Three of the five savory courses contained duck, the house specialty, though I could make the case that some of the duck dishes on the regular menu sounded more appealing. 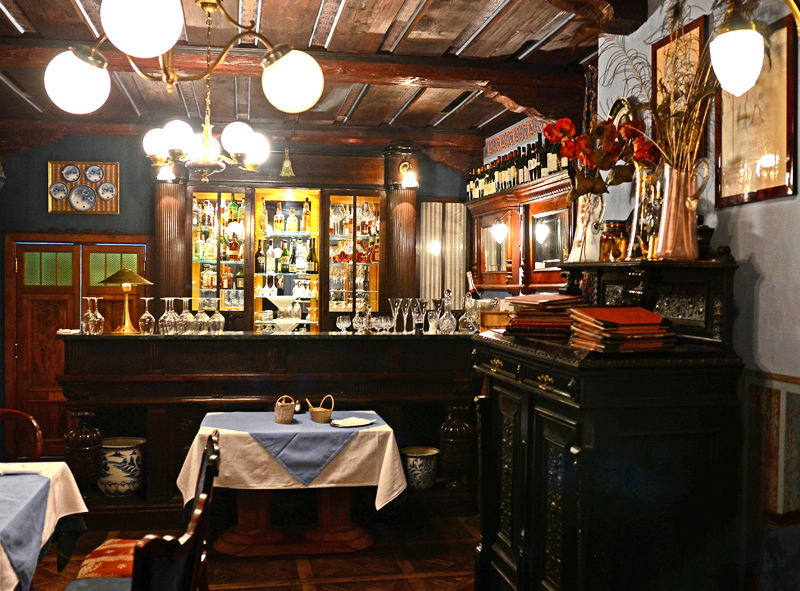 Located in a 16th century baroque house, the first Blue Duckling opened its doors in 1993. I would argue this is the prettier of the two, especially if you’re seated on the second flour (the first two pictures at the top of this post and the photo below were taken there). Malá Strana, though certainly not exempt from the hordes of tourists that invade Prague all year long, is also a tad bit quieter than the Old Town, and in many ways just as lovely. To start, the degustation appetizer offered three different duck preparations, a must-try in a place that specializes in the quacking bird. The maple smoked duck breast tasted good, but the smoke had a slightly harsh taste again. As Prague is not in Texas, I assume the restaurant doesn’t have a giant pit in which to very slowly roast their ducks over the heat of a distant wood fire, and the quality of the smoking process suffers accordingly. The onion marmalade announced on the menu was replaced with a sweet and sour berry sauce served in a spoon, which complemented the duck perfectly. 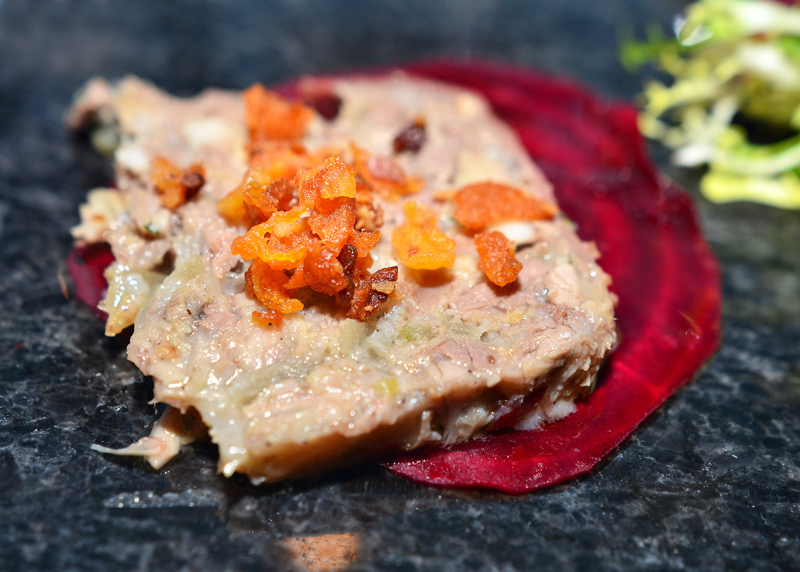 The duck rillettes, served on thin slices of marinated beets and topped with dried roasted apricots, were simply delicious. Glistening with grease (what else do you expect from rillettes! ), they tasted unmistakably like duck. 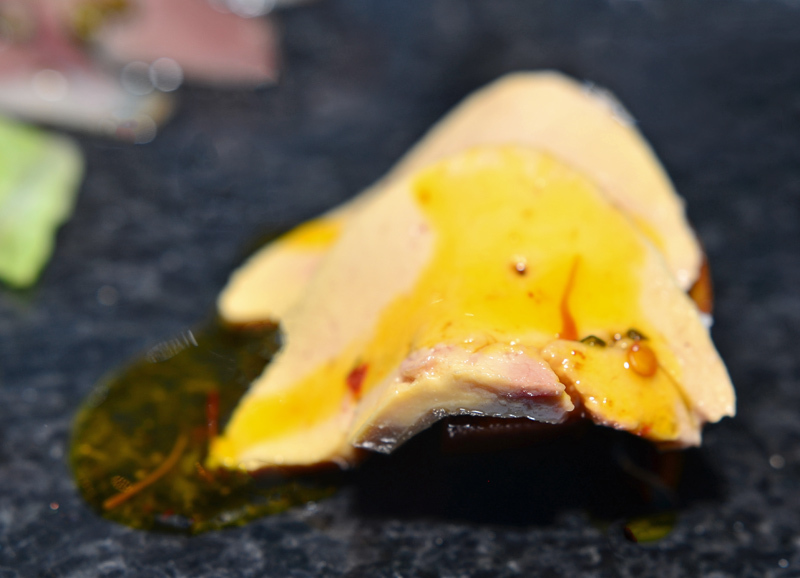 The seared foie gras was once again too thin, lacked salt, and didn’t look all that seared too me. It’s not that I’m expecting a bigger portion; it’s just that I’d much prefer getting a small cube of perfectly cooked foie gras rather than those slices that inevitably lack texture. 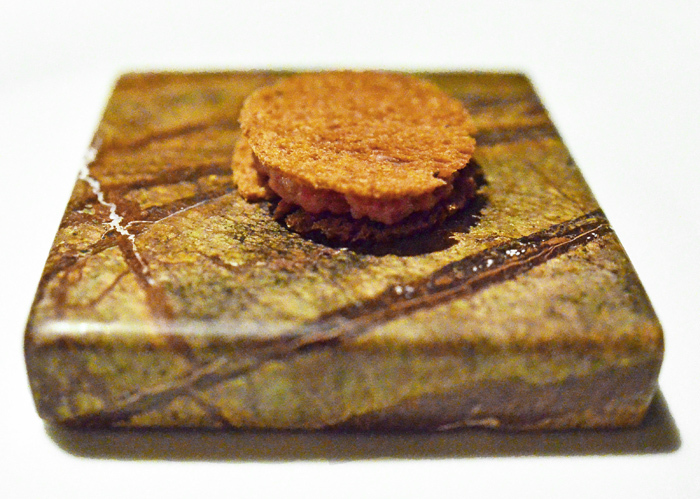 The foie gras came with what the menu called “honey orange”. Was that a reduction of honey and orange juice? I can’t recall, but I did note that it was very flavorful, and that the liver was served on top of a slice of orange. Despite my criticism, the trio was overall very good. The strong duck broth with egg custard and blanched vegetables reminded me a lot of the quail consommé we tried the day before, but without the fried noodles or the delicious duck hearts, and with more vegetables. 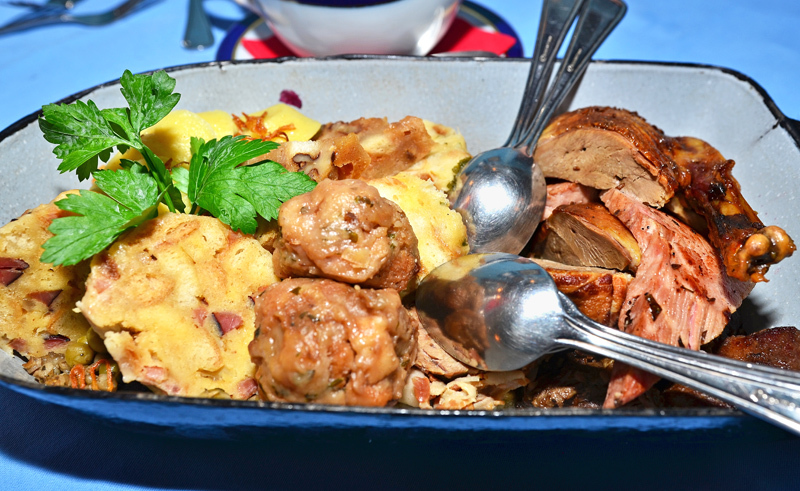 The Old Bohemian baking pan (for two) was the quintessential Czech dish. A bit like all the meat platters that you see in pubs wherever you go, folded into a single dish. It’s really a variation on the vepřo-knedlo-zelo theme, with a bunch of different kinds of meats, dumplings, and vegetables instead of just pork, bread dumplings, and cabbage. 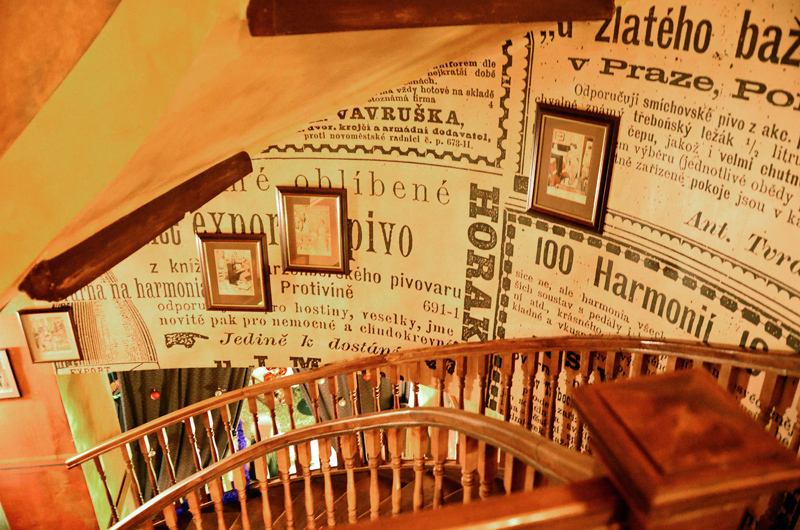 “Old Bohemian” seems to be synonymous with “rustic and very, very large”. If you’re going to try this debauchery of meat and starch only once, you might as well go to the Blue Duckling, as their variety is unrivaled: 4 kinds of meats, 5 different dumplings, and 4 garnishes. Let’s start with the meats. The roast duck was very tender, its skin crispy — the least one could expect. The veal roast with truffles consisted of tender slices wrapped in bacon, but the truffles were actually truffle oil, which I could have done without. 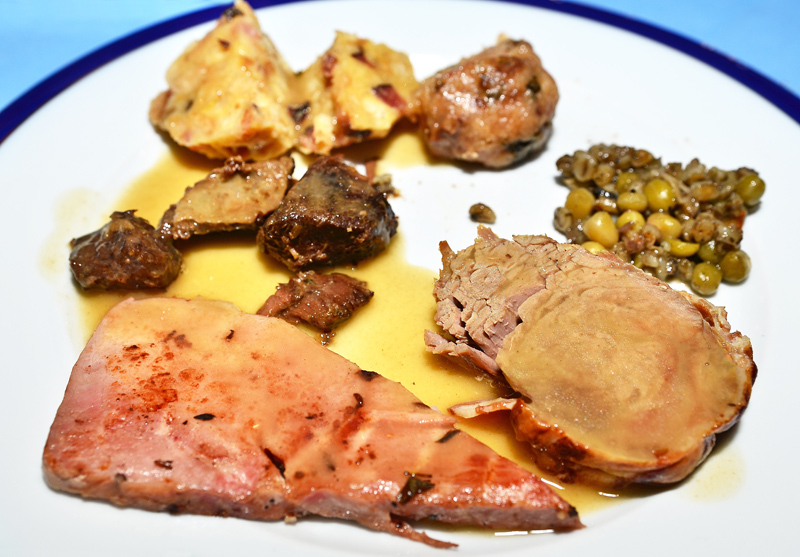 The wild boar roast (or stew?) won my top marks, being both tender and the tastiest of the lot. The Prague ham, however, was a little bit tough. All came with a single boat of sauce most likely made with the various meats’ juices. The dumplings definitely constituted the largest assortment I’ve seen in Czech Republic, or anywhere else for that matter! There was one kind with bacon (absolutely delicious), one with chestnuts (good too), one with walnuts (loved it), one more plain, maybe with a bit of fat (fine, but kind of disappointing compared to the others), and one made of potato (compact and too dense, really not very good). Whether two people need to (or even can) eat that much starch in a single meal remains unclear. The traditional side dishes included barley with green peas (a good idea), red cabbage (done simply, slightly sweet-and-sour), white cabbage (with caraway, a little bit sour but not too much so), and a few fried onions. The menu also mentioned a “mushroom cholent”, but I don’t remember seeing any such thing in the pan. Somehow, we still found room for dessert. 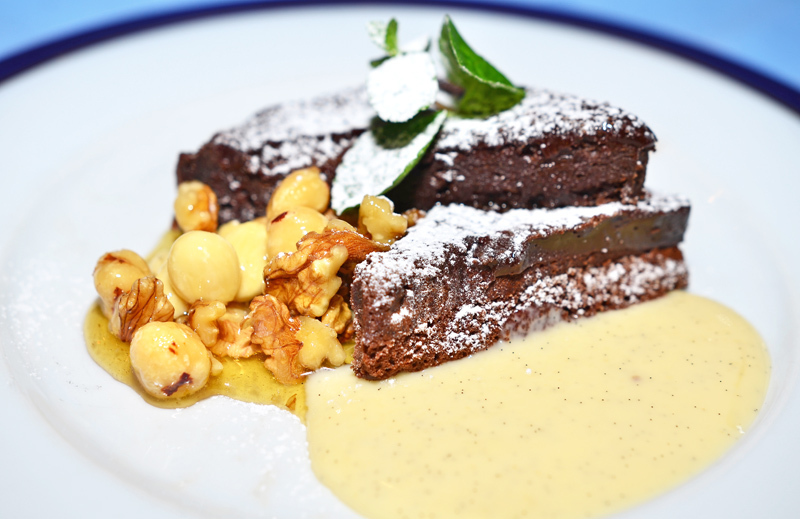 The hot chocolate cake with vanilla crème anglaise didn’t sound particularly Czech or original, but the cake was melt-in-your-mouth good, and the sauce really tasted like vanilla. Most importantly, it wasn’t overly sweet as many desserts tend to be. The nut mix on the side blended almonds, hazelnuts, and walnuts in a kind of lemon syrup. I haven’t talked about Czech wines so far. They do exist, and many of them are produced in Moravia. Like any self-respecting former communist country, Czech Republic makes sparkling wine, and nowadays it’s totally enjoyable. Otherwise, in my limited experience, I’d say that the local wines are usually perfectly drinkable but rarely memorable. I remember having a nice glass of 2012 Svatovavřinecké (made with Saint-Laurent grapes) “late harvest” by Moravíno, though “late harvest” seemed to mean something different from what I’m used to (i.e., it wasn’t a sweet wine). There were few false notes in this second dinner. 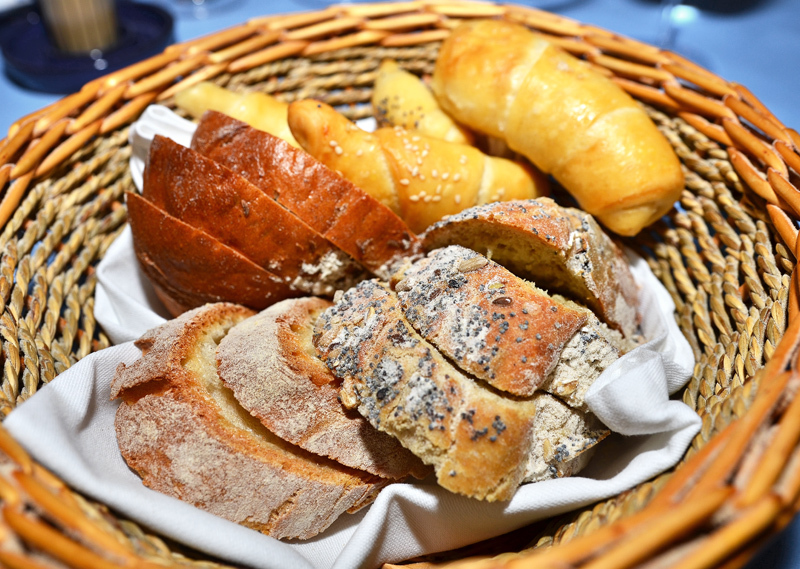 If our main course was pretty rustic, the appetizers were more elegant and creative. I also wish we’d had a chance to try even more of the duck dishes on the menu — between them all, they cover most of the successful food pairings with duck that I can think of (except for duck + black olives + cherries + cinnamon). Hopefully, I won’t have to wait another 12 years before coming back next time.